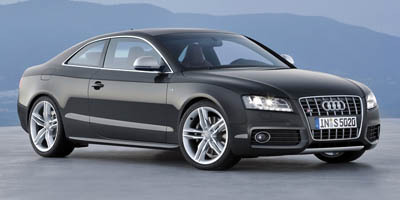 If you’re buying a car based purely on style, look no farther than the 2008 Audi S5. According to Audi, much like the Q7 SUV, the S5 was designed with the intention of invoking an aggressive and emotional style in buyers. With beauty being in the eye of the beholder, whether or not you buy into that philosophy is up to you; but there’s no doubting the S5’s ability to turn heads. The S5 experience is more than skin deep though; it’s got some attitude to it as well, with a V-8 powerplant that offers up brisk pace whenever you feel desire to move at a faster clip. With its sleek, contemporary lines, high-quality interior and powerband that taunts you to drive it as if you were trying to set a lap record at Road America, it’s difficult not to be won over by Audi’s new performance coupe. The S5 is built around a low displacement V-8 that loves to rev. Quattro all-wheel drive makes the S5 the sports coupe of choice in snow-laden locales. The sloping rear end of the S5 makes for minimal rear headroom. Paying a Gas Guzzler Tax charge is no picnic. Once behind the wheel of the S5, you’ll find if difficult not to mash the throttle, over and over again. Sudden acceleration is paired with a purposeful V-8 soundtrack that isn’t big bore guttural, but rather emits a powerful and sophisticated sound. The S5 doesn’t accelerate with rampant violence, but with a fluidity of power that’s perfectly balanced with the car’s dimensions and upscale demeanor. The clutch is well weighted and easily modulated, making stalls rare. Get the S5 out on a back road and the brakes quickly dispatch any straightaway acceleration, and the steering is direct and predictable, though there’s a minor delay between your turn-in and the car’s. Feedback at the helm is somewhat vague – likely due to a high curb weight of 3,891 lbs – though the prodigious grip offered by Quattro all-wheel drive makes the S5 an easy car to drive at speed. Audi’s flagship coupe is powered by a 4.2-liter DOHC FSI direct injection V-8, which makes 354 horsepower and 325 lb-ft of torque at low 3,500 rpm. Both a six-speed manual transmission and a six-speed automatic transmission are available, driving all four wheels via Quattro all-wheel drive. While the S5 comes standard with Audi’s Multi Media Interface (MMI) system, navigation remains a recommended option at $2,390. The nav package offers a larger, 7-inch (6.5-inch is standard) color screen located at the top of the center stack, a 6-disc in-dash CD changer and glove box located iPod connection cable. The MMI system uses a scroll wheel interface, making iPod integration very simple and intuitive. A Bang & Olufsen 14-speaker, 505-watt premium sound system is also on offer, as are carbon fiber and various wooden inlays. Audi offers a technology package, which includes a rear parking system and a rearview camera with directional guidance as well as adaptive headlights that pivot up to 15 degrees through corners. The package also includes a fun-to-show-off Advanced Key, which lets you open the doors and start the car with the push of a button while the fob remains in your pocket. Servotronic speed sensitive steering gauges road speed and weights up as speed increases, making low-speed maneuverability less work for the driver. To little surprise, a 4.2-liter V-8 churning out 354 hp isn’t the most fuel-conscious of engine designs. As a result, Audi claims the S5 returns 14 mpg during city driving and 21 mpg on the highway, and the engine receives an LEV-II emissions rating. The S5’s interior is a typically ergonomic Audi affair, with the center stack navigation screen flowing down into the thermostat controls and MMI buttons. We’d recommend the Magma Red interior Silk Nappa leather, as it contrasts beautifully against the S5’s dark interior trim, especially for those opting for carbon fiber inlays. Like all S-Model Audis, the S5 has a sophisticated and visually passive exterior, the model’s performance upgrades only hinted at by its 19-inch five-spoke alloys, massive brakes, lower front-end spoiler, S5 badges and V-8 logos which sit below the aluminum accented mirrors. While The S5 isn’t what one would classify as affordable, it’s hard to argue that it’s not well priced for what it is – a sophisticated V-8 German coupe. With an MSRP of $50,500, the S5 goes directly up against the Porsche Cayman and BMW Z4 M Coupe, both of which are priced within a hair’s width of $50,000. With a few options, the S5 reaches into the mid-fifties, putting it in line with the base prices of the Mercedes-Benz CLK550 and BMW M3 Coupe; though in the case of the BMW it can be argued that you won’t currently find one without a significant markup. The Audi S5 offers up an enticing blend of modern design, neck bending looks, outstanding comfort and stomp-on-the-throttle performance. The steering might be a bit numb in the corners and its thirst for fuel is enthusiastic, but few cars in this price range will get you so many looks and return such driving pleasure. As far as new, exclusive models go, it’s an absolute hit. Welcome to the show, S5.